The Machinery Publishing Company was situated halfway down West Street in a building called National House. I started work there in 1961 where I began as an assistant in the photographic studio on the top floor; my ‘salary’ was less than £3 per week at the time. I had many tasks which were applicable to the technology of the time, such as loading the film cassettes for the industrial photographers who went off travelling the country, taking photos of various machines working in different factories. I also loaded film sheets in cassettes for the plate cameras that were used at the time, as well as filling baths with developing chemical and running the glazing machine when hundreds of photos had to have the shine put on them. The photograph here was taken in the art studio which was on the top floor of National House. The desk with the pots and the stripped mug was mine; I am the ‘young boy’ third from the left. In the art studio, I was responsible for a wide range of jobs ranging from filing away all the finished artwork and visuals to making the tea for the artists. As a young trainee, the range of jobs that came my way was varied and interesting. The man immediately behind me at the back was Richard Kemp who lived in Woodingdean and drove a yellow and white Ford Classic. The man next to him with the glasses was Mr Hopkins and was my tutor really, teaching me hand lettering for the years I was there. The men in the white jackets were the artists while most of the others were photographers. The older man in the middle next to the ladies was the boss while the man next to him was his assistant as far as I can recall. The artist to my left was the chief artist and art studio head, while the young man just behind me on my left, worked in the sales office. The older lady was responsible as I recall, for everything from the wage packets we received each week containing actual cash, to all aspects of ‘personnel’. This is what would now be termed ‘human resources’. The young girls sitting to her right were the ‘office juniors’ and would have been responsible for jobs such as typing, filling, daily post, making tea etc. These tasks were not looked down upon, but were very much part of your learning skill, and considered essential as a part of your development to become successful. It was a different world then. Hi Chris, I also worked at the Machinery Publishing Company in West St, from about 1964 until 1966, and was a junior invoice typist in the Sales Dept, earning about 2 pounds 10 shillings per week. I don’t think I ever ventured up to the art department, even though I had to deliver mail to all of the different departments. I think the lady who was in charge of everything to do with admin was a Mrs. Blackmore, she was very nice, but my boss a Mr. Kennard was a tyrant, and used to be forever watching us through his office window that looked out on the typing pool, to make sure that no-one was talking. Did the Company eventually move to New England House, or am I going senile? Thank you for your comments Sandra. I do remember the names of the people you mentioned. I left in 1964 when they were still in West Street but yes they did at some point move to New England House where I used to visit to catch up with old friends in the art studio. By the way, Leo Sayer worked in one of the departments at one point as I remember – perhaps someone remembers this? Hi Chris, I certainly do remember Leo Sayer as I worked directly behind him as a paste-up artist in Machinery’s Studio. His real name was Gerry Sayer and we became good friends both being interested in music. He used to come back to my house and have meals sometimes, as in those days he often looked in need! He spent a lot of times dreaming and looking out of the window, and when I moved away up north he sent me a card saying ‘just on the verge of things’ which I still have to this day. It always makes me think of what he must have been dreaming of!! as very soon after that I saw him on television at the start of his destined fame. See more on Leo and also his comments on the ‘Wykeham Terrace’ entry on this site. Leo Sayer lived in a house in the grounds of Southlands Hospital, Shoreham, as his father was the hospital engineer. I am trying to confirm the architect of National House. The foundation stone refers to ‘H.E. Mendelsohn’, but I was told that this is because the stone mason was told that his name was Herr Eric Mendelsohn. If true, the building was designed by the same architect as the De La Warr Pavilion in Bexhill and should, therefore, be listed. Having researched National House at The Keep, their archive shows that the architects were Elcock & Sutcliffe ‘in consultation with H E Mendelssohn of 10 New Bond Street, London’. A 1937 telephone directory shows Heinrich Mendelssohn as ‘Progress Building Ltd’ at 10 New Bond Street. So, although Elcock & Sutcliffe were successful architects in the 1930s, they do not, unfortunately, have the cachet of Eric Mendelsohn. 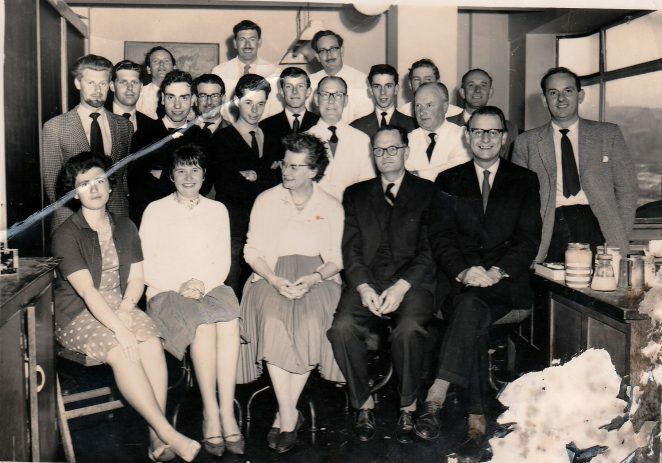 I worked at Machinery Publishing in 1946 when they were based at 17 Marine Parade on the seafront and Mr Mason was MD. InitiallyI worked for a Mr Savage in the Packing department and then for Henry Witten in Addressograph before leaving to work as a junior in Sales at Allen West in Lewes Road. It’s along time ago so I don’t remember the names of many of the staff but I do remember Mrs Blackman, John Bolton and Keith Darch, he lived quite close to me in Woodingdean. I have an invoice from this company dated 20/05/1944 for the Machinery’s handbook, with an apology for not supplying it with the Thumb index due to “war-time labour difficulties”.